Sitting in the garden in our childhood home in London my sister and I would spend endless hours creating stories immersed in role play. My sister was and actually still is passionate about horses, she would build jumps and dressed in jodhpurs work tirelessly to train the inadequate rider at the end of the rope. That rider would be me, her non equestrian sister who I have to say with hindsight, was incredibly patient with the endless rounds of the garden made on a hobby horse. When we were done playing riding and no, I never got to be anything but the horse, we would explore our garden finding things to do. We each had a little patch that we were encouraged to grow salad and herbs on and most summers were able to harvest a fair crop from our one metre squared. As well as tiny carrots and bright green lettuce I was the undisputed champion of Chives and would happily snack on them as I trotted past on my well worn fabric horse. When I was allowed to rest I would collect handfuls of chives and set about cooking with them in the garden. It is a wonder quite frankly that I am alive today to record the delicious recipe, now that I remember my house speciality, egg a la chive. Over a freshly dug pit filled with tea lights and a BBQ crate I would hold a bowl with whisked egg and chives and attempt to cook omlette by the power of candle. I actually cannot remember the taste which makes me wonder whether as a reward for all her hard teaching I let my younger sister have the honour. All these years later I still rely on herbs to flavour and enhance the dishes I cook. Just today the children and I hollowed cherry tomatoes and using a cocktail stick to keep them in place, filled the tomato with a mini mozzarella and a leaf of basil, a bite sized caprese salad if you will. A simple roast chicken can be transformed in moments with the addition of thyme and some lemon before going into the oven and I couldn't begin to make foccacia without beautiful long sprigs of rosemary studded into the voluptuous soft dough. 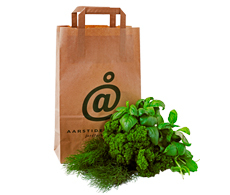 Aarstiderne offer a herb box dedicated to providing three types of herb each week, there is no set selection for that depends on what is being grown down on the fields at Billeslund in Jutland. This is where chief gardener Frank van Beek grows seventeen varieties of herb on the field, lemon balm, thyme, oregano, rosemary, basil, parsley and dill to name but a few. I wouldn’t suggest cold egg a la chive as my Something for the Weekend, but I do recommend using fresh herbs to bring excitement to your dishes. Why not try a quick fresh pesto with pasta or a dill dressing for some crisp Danish cucumber salad this weekend, your tastebuds will sit up and take notice.